If you've been wondering when the DLC for Magic the Gathering: Duels of the Planeswalkers is coming, wonder no more. Next Wednesday, October 21, new cards, new decks, new puzzles, and new opponents are all coming your way. Three new playable decks, including the AI-only "Relics of Doom" will be available. Each of the original decks get new cards to unlock, and new single player and co-op levels are included. 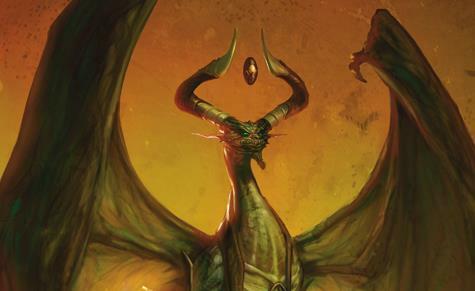 Famous planeswalking dragon Nicol Bolas makes an appearance, too! Sadly, only three new puzzle levels make it in the expansion; I really enjoyed these, and thought far more should have been included. All the card-slinging fun can be had for a mere 400 MS points. If only they'd add in online co-op! On October 21, Magic: The Gathering and video game fans worldwide can play with new decks, experience never before seen challenges, and battle new adversaries, on Xbox LIVE Arcade with the first expansion for Magic: The Gathering – Duels of the Planeswalkers. Players can also put their spell-slinging skills to the test to defeat the new single-player campaign and unlock Sarkhan Vol and Jace Beleren’s new Planeswalker decks.